Ever since I started learning how to design or teaching myself how to design back when I was using Myspace, I always had an obsession with fonts. Back in Myspace days, however, the font selection was nothing like it is today and I also never realized how influential fonts could be to the overall design. 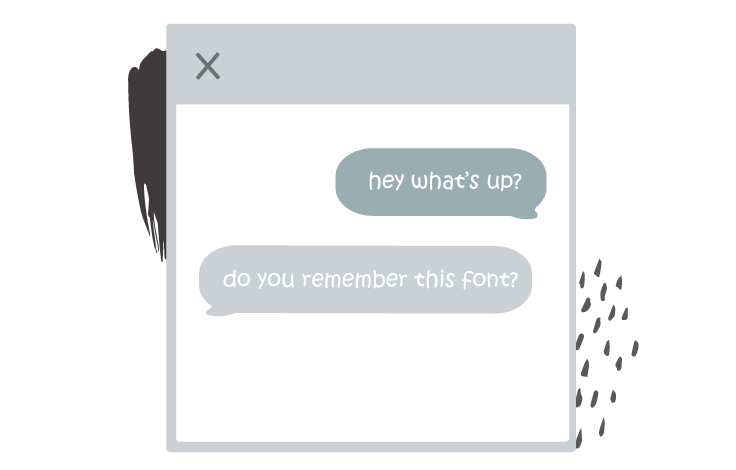 My AOL instant messenger font was always defaulted to Kristen ITC and looking back at it now, that font is just as bad as Comic Sans. I was probably chose that font because I thought it was “the cutest” out of all the selection (hides in embarrassment). After getting a formal education about fonts and typography, I realized how much design relies on it to convey a message. 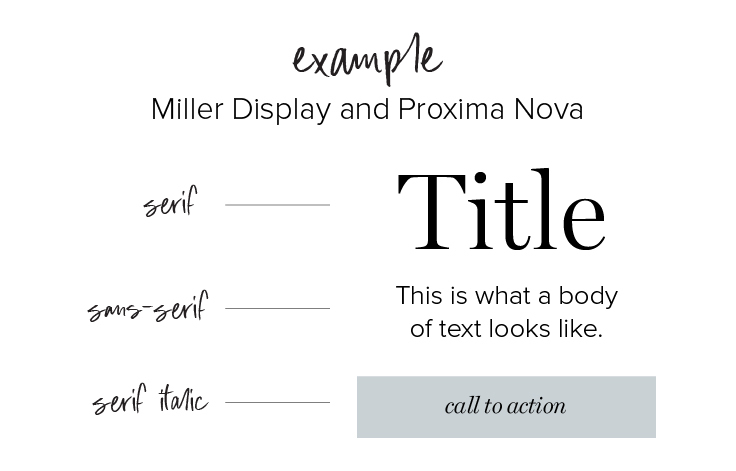 That’s exactly what fonts do for your brand as well, so that is why I want to give you this font lesson so you can choose fonts that align with your brand and messaging. Before we get into talking about all the fonts, you need to know what your brand values are and who your target audience is. We have a free download HERE that allows you to establish all of this before you start choosing fonts. Download that workbook, fill it out, and then come back here. Fonts can have different styles and weights and in return give off a certain mood/meaning or vibe. This is important when choosing a font for your brand because you want the font style to make sense with the rest of your brand. While there are many different font styles, we’re going to discuss the main ones and most likely the only ones you’ll need to know for your branding. Serif fonts can be identified by the extra “foot” or “features” that extend on the legs of each font. The most classic type of font that conveys a timeless and serious message. Most studies show that serifs are actually easier to read and that is why most novels and use a serif font. Popular serif fonts include: Times New Roman, Caslon, Garamond, Georgia, and Playfair Display. Sans-serif fonts do not have the extending “feet” called “Serifs” at the end of the strokes. Sans means “without” in French. Similar to a regular serif but each “foot” is thicker slab which changes the mood of the font. Slab-Serifs are used to convey confidence and friendliness. Script fonts mimic historical or modern handwriting styles. They look like different styles of writing instruments such as calligraphy pens to paint brushes. Script fonts can also be broke into another category considered “handwritten” fonts which are usually targeted towards females and personable. Finally we have display fonts. Display fonts are much more intricate or detailed and meant for large headings. Display fonts aren’t meant for large passages of text. Meant to be used sparingly throughout your branding. A lot of fonts being created now have multiple options for font weights. Instead of having the regular weight and a bold weight, fonts are starting to include more weights such as light, regular, semi-bold, bold, and black. Some fonts give even more options. Font weights allow you to create contrast while using the same fonts. For your brand you can create a title using a bold font weight while pairing it with the same font for the body but in the regular weight. Fonts that are bolder are more attention-grabbing and more like to draw the eye to them. Therefore, it is smart to make titles the bolder font. Now that you know the basic styles and weights of fonts we are going to use that to apply to your branding and how to choose the proper fonts. As you decide which fonts to convey the right message for your brand, keep in mind that you should only be using 2-3 fonts throughout ALL of your branding materials. Too many fonts can be confusing to look at and make you look less professional, and it is easier to stay consistent when you have less fonts. When in doubt, stick to 2 fonts. You want the fonts you choose to have contrast. 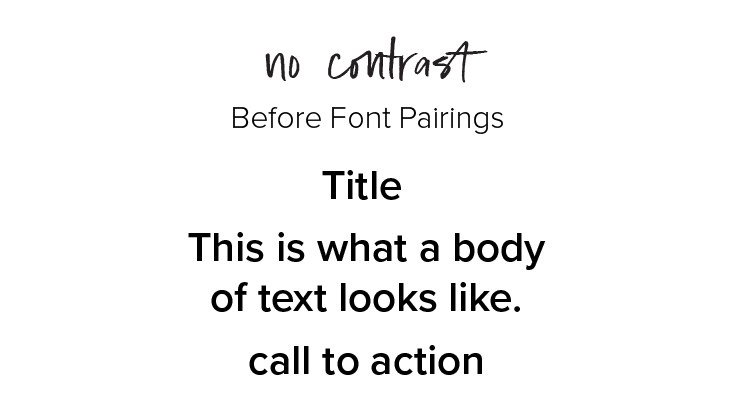 Contrast means that there needs to be a clear distinction between titles, text, and the call to action/button text. Look at the example below, when fonts don’t have contrast versus when they do. There are a few easy ways to create contrast. You can create contrast by using the same font with different weights and font sizes. 2. Another way to create contrast is to pair two different style fonts. For example, pairing a serif font and a sans-serif font. 3. Another common way to create contrast is to you tracking or kerning to create a distinction between titles, subtitles, and body text. So now that you know what types of fonts to look for, you will need to know where to find fonts on the internet. If you are just starting out, we recommend using Google Fonts. Google fonts is an amazing resource that offers free fonts for personal AND commercial use, and Google fonts is integrated with majority of software and online programs that you will be using. The Google Font website also makes it really easy to search for fonts that you need, including by the style of font and the amount of weight variations. Most Google fonts are available to download at FontSquirrel.com which is also another favorite free font resource. If you are looking for paid fonts. If you are subscribed to any Adobe programs, you can get access to the Adobe Toolkit which also has a wide range of fonts to choose from that you can sync with Adobe programs. We could write a whole blog post just on the legality of using fonts in design, so we won’t go into too much detail here but it is worth mentioning that each font has its own licensing agreement. Like we said earlier, Google fonts are free for commercial use which means that you are legally allowed to use them in anything that you design. However, there are many websites out there that offer free fonts but you have to be sure to check their licensing agreement. Each font has their own and will say if they are okay for personal use or commercial use or both. Commercial Use means that you are using it in any way for your business that profits from it. So make sure the fonts that you download are allowed to be using commercially.